Protect you and your family, whilst prolonging the life of your boiler by booking a boiler service today! 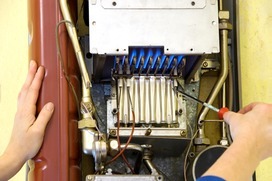 It couldn’t be easier - to get your boiler serviced by a Gas Safe registered engineer, Just a quick call to one of our office and we’ll advise you on any aspect of servicing and if we think you require a boiler service. As every landlord knows, its a legal requirement to have a gas safety inspection carried out on a rented property. Its also a good idea to have an inspection carried out if you have had a smell of gas or you have just purchased a property.